Through a concerted effort, our state historic and cultural treasures will be preserved for future generations. The Minnesota Historical Society had awarded a Minnesota Historical and Cultural Heritage Grant in the amount of $103,825 to the Dodge County Historical Society. The grant was approved by the MNHS Executive Council on December 4, 2017, and will support the Wasioja Civil War Recruiting Station restoration project. Minnesota Historical and Cultural Heritage Grants are made possible by the Legacy Amendment of the Arts and Cultural Heritage Fund through a vote of Minnesotans on November 4, 2008. The grants are awarded to projects of enduring value for the cause of history and historic preservation across the state. The Wasioja Civil War Recruiting Station project is of enduring value because it will assure the complete and professional restoration of a tangible link to the past. Work is set to begin on April 15, 2018, with a maximum anticipated completion in 14 weeks. MacDonald & Mack Architects (Minneapolis) drafted the specifications and created plans for the project. The work will include mortar testing, repointing of brick and stone, replacing sealant, removing and replacing of wood shingle roof, and excavation and reseeding. The Wasioja Civil War Recruiting Station is located in the Dodge County hamlet of Wasioja. It was listed on the National Register of Historic Places in 1975 as part of the Wasioja Historic District. The Minnesota Historical Society is a non-profit educational and cultural institution established in 1849. MNHS collects, preserves, and tells the story of the state’s past through exhibits, libraries and collections, historic sites, educational programs, and book publishing. For more information about the Minnesota Historical and Cultural Heritage Grants program, including deadlines, visit legacy.mnhs.org/grants. To learn about current and past grant projects, visit legacy.mnhs.org. In July 1917, Dodge County officially formed a chapter for the American Red Cross. However, the work for the Red Cross and the war effort had begun earlier that year when the first of Dodge County men went into the service at Fort Snelling. By the time those men left Minnesota for training in New Mexico they were supplied with an abundance of war comforts prepared by the women of Dodge County, who would later make up the work force for the Red Cross. With the help of E. L. Sanford, director of the Dodge County chapter, the women of Dodge County were able to pass every quota the Red Cross had for Dodge County. By the end of the war in 1918, Dodge County had raised $40,000 and supplied soldiers and relief efforts with over twenty thousand articles of clothing, bedding, bandages, etc. Historic artwork of a Red Cross nurse flanked by members of all branches of the armed forces. The work of the Dodge County chapter was carried out through five branches under each of which was one or more auxiliaries. The branches took care of the detail of the work, looked after raising the quotas of both work and money and left the chapter officials to look after the management of every factor of the chapter. Each branch of the Dodge County chapter of the Red Cross helped out the war effort tremendously. Branches were at Claremont, Hayfield, Kasson, Mantorville, and West Concord. In Mantorville, the branch exceeded every allotment of goods or money quota assigned to it during the war. At one Mantorville fundraiser an egg was sold and resold until it had brought in over sixty dollars. The Kasson branch dealt almost exclusively with aiding in the equipping of the Mayo Brothers base hospital at Rochester. In addition to helping supply the base hospital with bandages and other items, the Kasson branch also helped supply clothing for refugees and war sufferers in France. The West Concord branch was home to the first Junior Red Cross organization in Dodge County. Every teacher and pupil in the school took part in various project to help the effort. Some of these projects included making of garments, knitting, gathering of clothing for refugees, and saving fruit pits. One project that many Red Cross chapters across America took part in during World War I was the making of Red Cross signature quilts. For a one dollar donation, your name was embroidered on to a quilt. Here at the Historical Society we have a quilt that was made by the Concord Farmers Club in 1918 on display and also pictured below (donated by Marilyn Miller of West Concord). 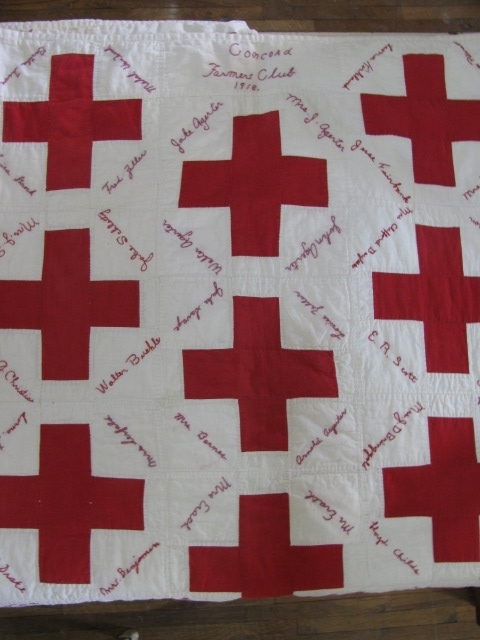 During a visit to the Dodge County Museum, author Erica Vetsch saw our Red Cross quilt and was inspired not only to write a book, but to make a quilt of her own. With the help of her sister-in-law, Linda Amrose, Erica made a Red Cross signature quilt with the names of over three hundred Dodge County World War I veterans embroidered on it. This quilt can also be seen on display in our museum. A Bride Sews with Love in Needles California by Erica Vetsch is available for purchase on Amazon, Barnes and Noble, and many other book retailers. Source for Dodge County information: A History of Dodge County, Minnesota, in the World War (1917-1919), a Chronicle of the Activities of Soldiers, Sailors, Officials and Citizens. The DCHS Board of Directors meets the third Thursday of each month at the museum. Visitors are welcome to all open meetings.